CUPE delegates will be attending the United Nations Climate Change Conference which will be held in Cancun, Mexico, from 29 November to 10 December 2010. In preparation for the conference, CUPE has prepared a fact sheet outlining our proposals and demands, and why it is important for CUPE to be present. 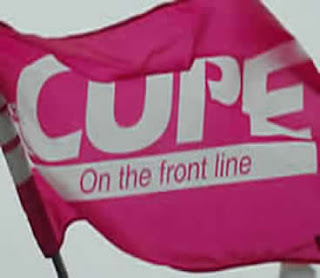 CUPE, as a partner and affiliate, participated in the development of the environmental positions and demands of the Canadian Labour Congress (CLC), the International Trade Union Confederation (ITUC), and Public Services International (PSI), which we strongly support. – Limit global warming to an increase of two degrees Celsius. – Compared to 1990 levels, achieve an 85 per cent reduction in GHG emissions by 2050. – Establish mechanisms to ensure that targets are legally binding and that states respect their commitments. – Ensure fairness between poor and rich countries, so that the latter do their fair share. Show good faith and become a part of the solution rather than remaining a part of the problem. Canada must adhere to international targets and stop its strategy of obstruction. Respect the will of the majority of Canadians (and the majority of Canadian Members of Parliament!) who want to see the adoption of concrete targets and actions on GHGs. Strengthen and develop clean energy production, under public ownership, control and delivery. Gradually eliminate public subsidies to the oil industry, and invest in green energy alternatives. Implement incentives that would encourage workplaces and industries to act responsibly on environmental issues and climate change. Invest in training and just transition programs for affected workers and their communities, thereby maintaining and creating jobs in the new green economy. Why is it important for our union to be present at this conference on climate change? The majority of Canadians recognize that climate change is a problem and want strong actions taken — both domestically and internationally — to address the issue. Sadly, the current government of Canada does not represent the will of the majority. The minority Conservative government of Canada must drastically change its course. We are here to contribute to that objective. The Canadian Union of Public Employees (CUPE) represents over 600,000 workers in Canada, particularly in municipal services, energy, health and transportation sectors. Our members are workers. But they are also global citizens. Protecting the planet from irreversible environmental degradation and climate change is part of our mission as a union. As the largest union in Canada, we believe that it is our responsibility to put pressure on our own federal government to do what is required – both domestically and internationally – to tackle the problem of climate change in good faith. As a strong public services and public interest advocate, we want to propose a broader vision to the issues facing our society. Environment, energy, local services, water and health are all closely related. Working alongside governments, civil society and employers, CUPE believes that unions can play a positive role in creating greener workplaces and modes production. You can download our brochure “A Workers’ Action Guide to a Greener Workplace” from our website. Download a printable copy of the fact sheet. This entry was posted in Events and tagged Labour. Bookmark the permalink.